Unit Commander George Patterson. Behind him (l to r) Margaret and David B Harrison and Alan Turner-Morris. 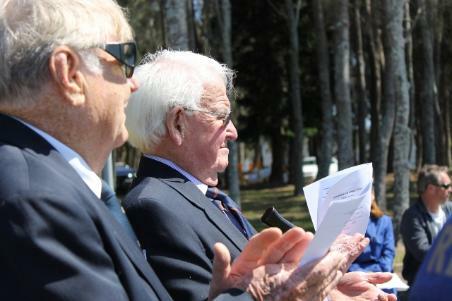 L to r: Geoff Wilson (former Division Commander BBMR) and Don Southwell, Life Members of Marine Rescue who began with the Volunteer Coastal Patrol in 1968. Harrison Family: David, Margaret, Andrew and James. Photos and Report by A J Guesdon, 2012. All Rights Reserved. 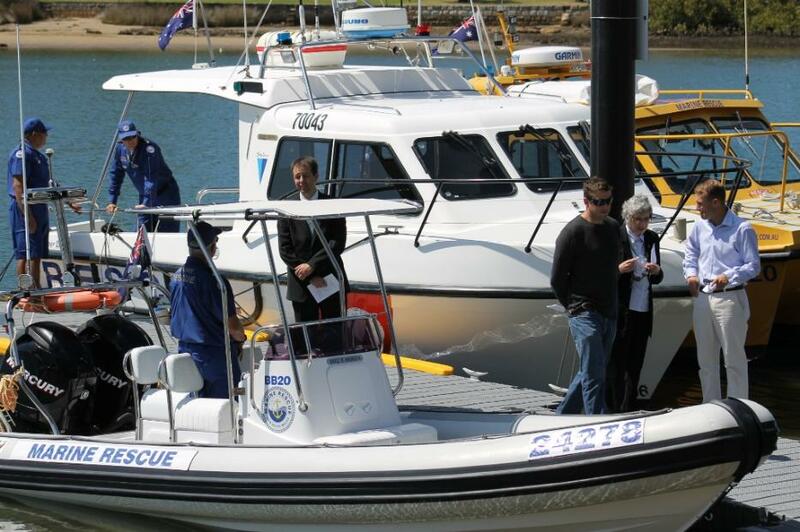 On Saturday 13th October 2012 Marine Rescue Broken Bay Unit commemorated the completion of its new wharf and the naming of their new additional lifeboat the “David B Harrison”. 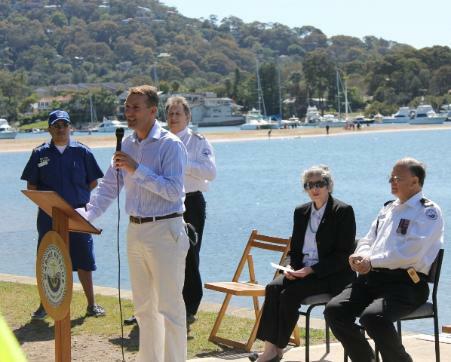 The local member for Pittwater the Hon Rob Stokes MP participated in the ceremony at Rowland Reserve Bayview which was attended by Cr. Ian White and led by Unit Commander George Patterson. 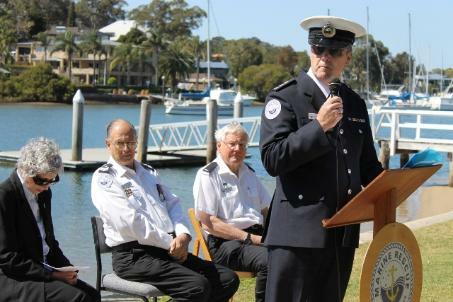 Marine Rescue Broken Bay whose motto is ‘safety of life at sea’ formally opened the security gate to their new wharf at the boat ramp at Rowland Reserve, Bayview. This wharf has been a triumph of persistence to get completed. It has taken about 12 months to get through the process before permission was granted for its construction. Former Unit Commander Victor Lawrence, a gentleman of energy and acumen whom we met last year, and Michael Seal were warmly thanked for their determination and persistence in ensuring this wharf was completed and also for all the hard work he did in ensuring the David B Harrison became a reality. Hon Rob Stokes reiterated in his address the vital service this volunteer unit has provided since pre-war days, during the course of WWII and even up until today. The Broken Bay Unit of Marine Rescue celebrates its 75th year in November 2012 and has provided assistance to countless ocean going vessels and people during these decades. The David B Harrison, named after a long serving member who has been a part of the BBMR since 1974 was ‘christened’ with champagne by Mr Harrison’s wife Margaret in the traditional way for sea-going vessels. This new lifeboat is capable of travelling at over 30 knots to assist in any rescue that may arise. “Years ago Chris Cardiff-Jones of the Canoe Association asked us to provide our safety vessels for the canoe race from Windsor to Brooklyn. This was done at night time. it is now in its 37th year with over 500 paddlers raising money for charity. It started from nothing and now is known worldwide as the Hawkesbury Canoe Classic. So it was great to support that. How did you first get involved with BBMR sir? 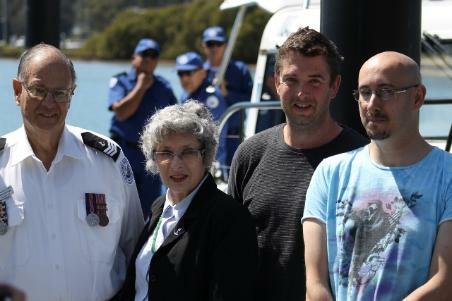 David and Margaret’s sons James and Andrew attended the ceremony yesterday, stating when asked that they were very happy about the vessel being named after their father, James pointing out his dad had been doing this for longer then he’d been alive. Another great note from yesterday was the news that local gent Terrance Joyce has this week been appointed and newly promoted to Superintendent and is now Regional Training Officer. He will have around 1200 volunteer Marine Rescue men and women to keep up to date, which represents around a third of New Souths Wales. This is another indication of the calibre of folk looking after those in the Broken Bay area of this Marine Rescue Unit. 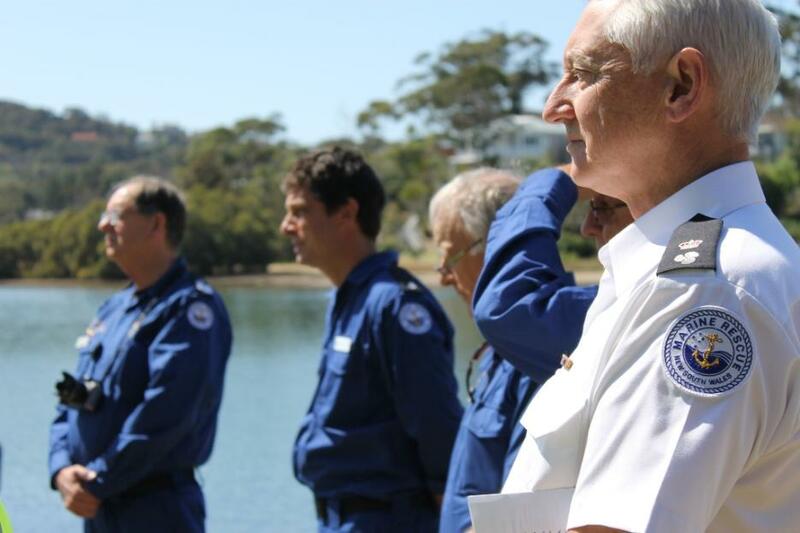 The Volunteer Marine Rescue Unit of Broken Bay offers a variety of courses to those new to boating or even those who wish to upgrade their skills to keep themselves safe at sea. At front of frame; Superintendent Terrance Joyce. Front to Rear: 'David B Harrison', the 'Peter E Weston' and Cottage Point Marine Rescue Vessel'Cottage Point 20 (CP 20)'.